You know drivers don’t pay attention during regular driving conditions. If you think drivers don’t see motorcycles when making a left turn, even worse are drivers backing out of a driveway or parking spot on a street or parking lot. This photo shows a series of driveway parking spots on the right side of the street with cars parked in some of the driveways. A driver backed out of one of those spots right in front of our client’s motorcycle. There was no way for the motorcyclist to avoid hitting the car by breaking, so he put his motorcycle down. There was no contact with the car and motorcycle and because the motorcyclist but his motorcycle down, he was able to avoid more serious injuries. However, he sustained an injury to his thumb. Although surgery may have helped him, he did not get surgery and has a loss of range of motion in his thumb. The insurance company offered only $5,000 because the motorcycle did not contact the car and they said the motorcyclist did not need to put his motorcycle down but put his motorcycle down only because he was scared. We know that motorcyclists will never put a motorcycle down unless it’s absolutely unavoidable. 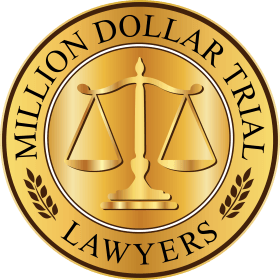 At arbitration, our client was awarded $100,000 for his injury. When a car is backing out of a driveway or parking spot and hits a motorcycle, it is usually 100% the fault of the driver of the car. We will file a motion for summary judgment which is a paper asking the court to rule that the driver is 100% at fault and allows the motorcyclist to get 9% interest on a judgment against the driver. Pulling out of the back of a driveway is one of the most dangerous activities you can do in your car because you’re facing away from traffic and there could be a child, pedestrian, bicycle, motorcycle or car which could be hit and all of them have the right-of-way. If you had a motorcycle accident, call a motorcycle attorney familiar with the unique issues of why drivers don’t see motorcycles.